Figure 1. Cross section metallograph remote from the leak (36 inches away). The dots are locations where we measured the hardness. Figure 2. Cross section metallograph of a different manufacturer’s pipe. Within months after completion of a newly constructed commercial building, leaks started to appear in some of the fire sprinkler system pipes. They were nominally 1 ¼ inch diameter steel pipe in 20 foot lengths with a 0.065 inch wall thickness (Schedule 5). Our investigation discovered three types of leaks, and two of them were installation related – poor welds at some fittings and improper forming of roll grooves. The third was a manufacturing defect in the forming of the pipe seam electric resistance weld, or ERW. Near the leaks we discovered discontinuities in the ERW weld, or areas where the seam appeared to have not been properly formed. During manufacturing, this type of pipe is formed from initially flat sections; it is rolled into a round shape and the edges forced together and electrically welded. The process is autogenous (no welding rod is used) and forms a longitudinal seam along the length of the pipe that is easily visible from the inside of the pipe by the appearance of the weld upset. 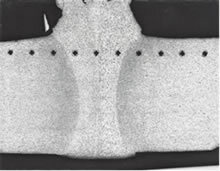 The weld upset is a raised area where the metal has been extruded during heating and pressing to form the seam. Our examination revealed that locations along the ERW seam weld where the weld upset is minimal appear to be the locations of the weld discontinuities. We cut a cross section of the pipe near the location of the leak to view the microstructure of the weld formation region. Certain features of the microstructure here can reveal the quality of the weld. 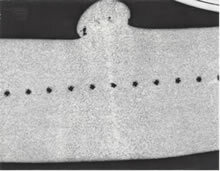 Figure 1 is a cross section metallograph remote from one of the seam weld leaks (36 inches away). Comparison of this cross sections to another manufacturer’s pipe seen in Figure 2 reveal that the ERW weld on the leaking pipe has a relatively small upset area, and lacks proper heat of fusion. The leaks were caused by poor welding at the factory.